I have faith. Often more than I realize. God’s word is truth and I believe Him for it. Jesus is my Savior and I’m exceedingly grateful for the promise of heaven. I have health, and blessings, and provision far greater than I deserve. But some days, gladness and gratitude elude me. The Light seems far off and darkness casts a shadow. It’s a funky type of exhaustion that settles into my bones and leaves me wordless and a bit withered. And rather than choose the better part, or even think on the pure and lovely, I just want to find a soft place to lay my head down. Not to pray, or seek, but simply rest in what I know. There was a time in my life when this place would be one of condemnation, of whispers of faithlessness. But God has shown me that it is something far more delicate, sweet even. It’s a sustaining faith that meets me in these moments. It isn’t broken or weak, as some might call it. And although it’s not after knowledge or growth, this brand of faith is as alive and vital as the kind that pursues. It’s pure and unadulterated. It’s a faith that wraps me in grace, holds me close, and gives me permission to simply be what I am…His. This faith beckons me to crawl up into my Father’s lap, nuzzle my face in His neck, and relent the sigh of a heavy day. It doesn’t ask questions or wrestle over answers, but simply rests in the presence of One that is stronger and safer than the world outside His arms. In our picked-up pace and passing time, we’ve forgotten about faith that rests. We’ve convinced ourselves that “right” faith ought to drive us deeper, or call us higher, or work itself out. We wonder if there is a word we’re not hearing, or a message that we’re missing, and we forego the beauty of simply being still with the One who longs to be known by us. Weariness isn’t a mood disorder. It’s a soul longing. It’s our heart pointed toward its resting place; its Creator. It’s our mind turning off the ought-to and the must-do and simply finding itself captive before its Maker. It’s our soul longing for the One that can truly satisfy. It’s not faith that’s less than it’s supposed to be, it’s faith that points us to exactly what we need. You can find these words linked up at my favorite spots: Holly Barrett (#testimonytuesday), Kelly Balarie (#raralinkup), Holley Gerth (#coffeeforyourheart), Kristin Hill Taylor (#threewordwednesday), and Jennifer Dukes Lee (#tellhisstory). This was a vitamin of hope here, ” Weariness is not a mood disorder. It is a soul longing.” Yep, I needed to ingest that great strong faith seed today. Thank you, Tiffany. This time of year tends to pull the thread of that blanket of grace we should cover and allow to warm and refresh, but it doesn’t always happen and then in stead of running for the safety of its sheltering promise, we push ourselves, condemn our weakness, and miss the invitation to come rest. Rest is a necessary tool in the preparation, isn’t it. So, good to rest with your words and His Truths today. You have captured it so beautifully, Dawn. Weariness can be a broken cycle of condemnation and guilt, rather than lead us to the balm of grace…yes! I’m still learning to listen to that soul longing over the guilt, but I know for certain that finding rest in Him yields the far better outcome. So blessed you joined the conversation today. Hugs. I love this post because it speaks to me so much. I used to feel that weariness and it was depression seeping in and through and I just wanted to escape into my hole and now I still feel weary and tired and all of that but my faith steps in and allows for me to simply be at peace with God and with myself because of Him. Thank you for the reminder of where I was and where He has brought me! Fantastic, Marisa! It’s true, the weariness unchecked can really escalate into other issues, which are very real. But so often, we feel dysfunctional simply because we are worn out. We don’t give ourselves permission to rest. Jesus gives us an open invitation to find rest and refuge in Him…to find the peace we need the refresh our weary souls. Thanks for joining the conversation today! “Weariness isn’t a mood disorder. It’s a soul longing,.” I’m going to park on these words today. I can relate to that “funky type of exhaustion!” Great words for me this time of year. You are absolutely right about weariness being a soul longing. We all need to rest in Jesus! Visiting from #TellHisStory. Thanks for visiting, Kristen. Glad you could relate to the words and the longing for rest with Him. Blessings! Your words bless me today, Tiffany. Yes, I know that place well. And like you said, I am so thankful I’ve learned to embrace that place as my special time to be still in His presence. 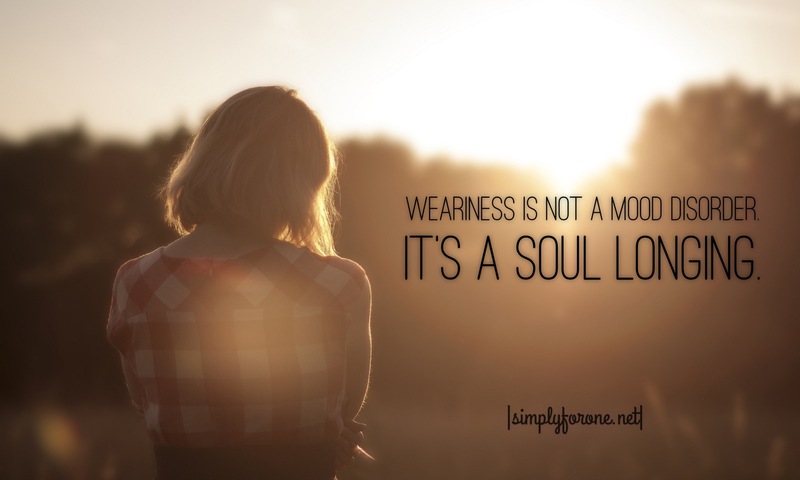 “Weariness is a soul longing.” How beautifully put! Thank you, Kristine. It’s a beautiful thing to have refuge with our amazing God. Blessed you visited today. So glad the words met you, friend. Love you. Oh, this is so good, and it reminds me of the old saying that for Christians, everything comes down to a spiritual problem. So thankful to have the comfort and joy of a safe landing! Me too, Michele. It makes the difficult times much easier to push through when you know safety is always waiting for us. Thanks for visiting. It’s been a rough day filled with grumpy, whining, disruptive students (they hate change and vacation is coming up on Thursday). I need to do a little crawling into my Savior’s lap (metaphorically, of course, although curling up in the corner sounds good right about now ;) ). Ack…I know what those days look like! 😐 Maybe a snack, nap, and some time just resting in Him is just the prescription you need. I’m sure that vacation won’t hurt either. Take care, friend. I know that search too. But how sweet it is to just rest in His presence. Thanks for visiting today, Valerie. That sounds like a long day. Love that Jesus meets us wherever we need Him…even the car! So glad you found your sweet spot. Hugs, friend.